You are currently browsing the tag archive for the ‘jacinta bokma’ tag. It’s been a long time since I posted a Sunday Salon. But today I wanted to share my growing pile of vegan cookbooks for VeganMoFo. When I started ExtraVeganza! in January I didn’t have a vegan cookbook worth mentioning. That wasn’t a problem since I managed quite well with my vegetarian cookery books and the Web. I hadn’t used my World Food Cookbook as intensively before and was very content with the amount of vegan recipes! 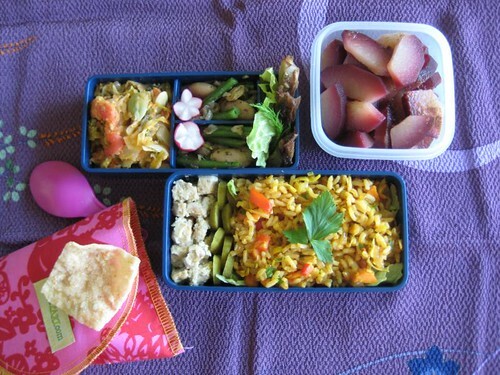 The Vegetarian Table: Japan turned out a faithful companion to my journey as well. Still, it’s no fun picking a recipe and having to think if, and how, it can be veganised. Especially when you have to conclude it’s no use trying… Remember I am just a beginner! Also, even though much of your regular cooking can easily be made animal-free, there are some basics that make life as a vegan easier. My silent wish for a completely plant-based reference book was quickly granted by my sister-in-law, who gave me Sarah Kramer’s La Dolce Vegan! It was an instant success (which I’ve raved about but still need to expand upon) but while looking for another appropriate handbook something else hit me: the difference in American and European cooking, especially concerning ingredient availability. 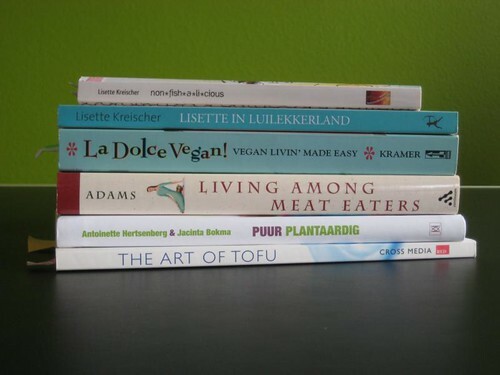 So today I own no less than 3 Dutch vegan cookbooks! Antoinette Herzenberg & Jacinta Bokma’s Puur Plantaardig, Lisette Kreischer’s Lisette in Luilekkerland and Non*fish*a*li*cious (admittedly the latter contains 1 non-vegan recipe which uses a vegetarian tuna-substitute). I haven’t really cooked from these yet, but that’s because I thoroughly had to explore my library copy of Ecofabulous first. I’m eagerly awaiting the ‘ecofabulous’ *drop* into my mailbox and from that moment I guess I’ll own about all the Dutch vegan cookbooks existing on the planet. But as Puur Plantaardig was only published last month (!) and Non*fish*a*li*cious in June this year, it’s safe to conclude that green living & vegan eating is gaining popularity! Two other vegan (cook)books that I actually did own already before ExtraVeganza! are Akasha Richmond’s The Art of Tofu and Living Among Meat Eaters by Carol J. Adams. The first is a kind of promotional publication for Mori-Nu tofu, the latter a nonfiction book about how to handle aggressive questions about your strict vegetarian (= vegan) lifestyle. I bought ‘Meat Eaters’ years ago but didn’t really get around to reading and certainly didn’t try any of the recipes at the end of the volume since they all contained one or more ingredients not commonplace as far as my kitchen cupboards are concerned. Now they are. ;) The same goes for The Art of Tofu. So I’ll probably be checking their indexes out again in the near future. I’m specifically interested in Akasha’s baking blend that works as an egg-replacer. There are several easier egg-substitutes around so I’m curious if this one’s better than the others. Let’s hope I’ll manage to review all of these vegan cookbooks in the near future! Do you have any recommendations on books I should add to this collection? It goes without saying that they don’t need to be Dutch! After finishing all 3 volumes of Haruki Murakami’s 1q84 last week I decided to give Tinkers another try. It’s a quick read and didn’t win last year’s Pulitzer Prize for nothing, right?! And yay, it’s that time of year again! Dewey’s semi-annual 24 hour readathon runs on Saturday October 22nd. I usually just join the fall edition and I’m a bit sad that I can only partly participate this time because of an important birthday party I’m going to. The official starting time in my area is 2pm (GMT+1). That would hardly leave me any time to read so I’ll be beginning my readathon at 8am. As I will be staying over after the party I’ll stop the readathon at the beginning of the evening (before or during our trip) and write a wrap-up post on Sunday afternoon when I’m back home. Next Sunday I’ll show you the books I plan to pick from! Are you joining in as well? Reading rules! This post is also submitted to Beth Fish’s Weekend Cooking.